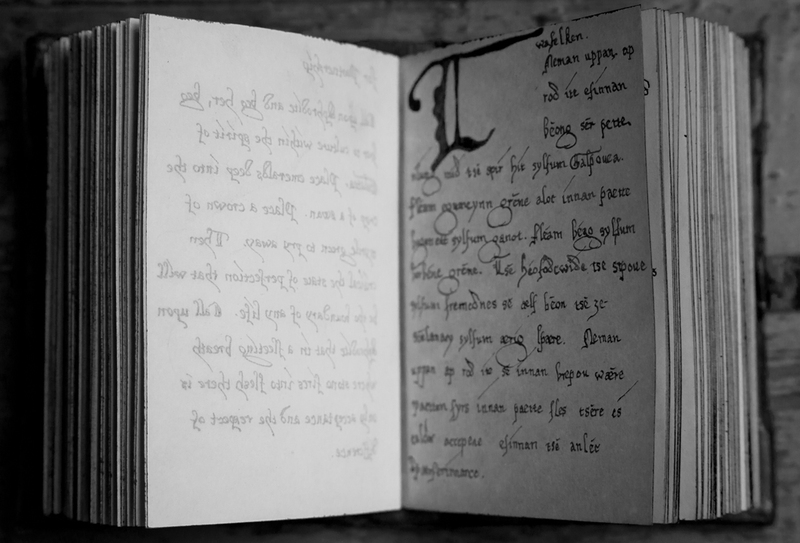 The Ephesia Grammata  or the Book of Spells is the work of J. L. Nash. It contains handwritten calligraphy, original texts and illustrations in a form of book. It contains modern English and an amalgamation language developed specifically for this project which hails from Anglo-Saxon, Middle English, Greek, Latin and the imagination of the artist. The language has structure, form and tenses. Its syntax conveys the energy and magic of meaning, translated through the Modern English calligraphy on overleafs within the handmade book. In a time when language is ever changing and developing, this installation infuses old words with ancient human desires and needs through the spells of the incantations as heard on a sound-track which accompanies. The book is illustrated by Predrag Pajdic. Bookbinding and cover made by Edward Stansell of Craft Bookbinding Co.